It’s not that people don’t like him. He’s like a human party favor … fun to have around but not the reason you came. 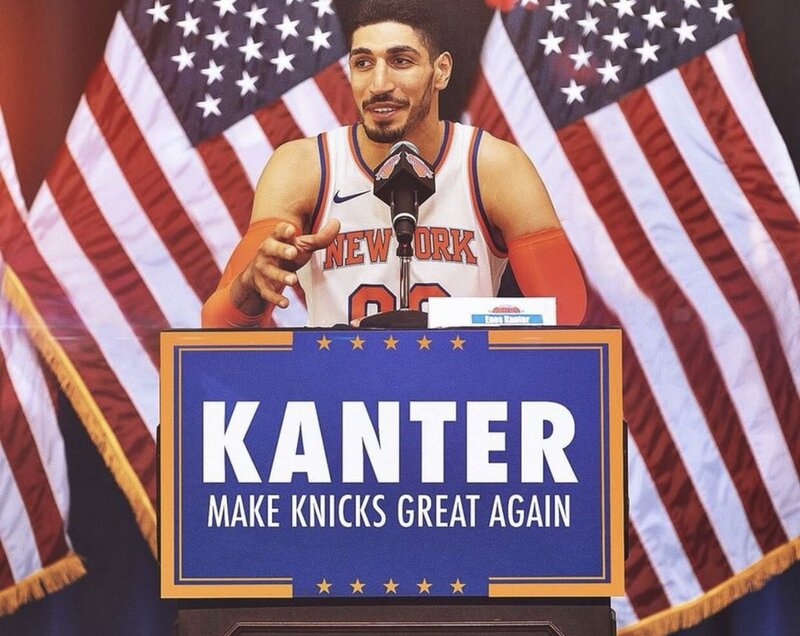 The Knicks were going to be bad this year anyway, and Kanter seemed like a good dude to have in the locker room. Plus, it’s not like the money was going to be spent anywhere else, with the team hoarding its acorns for a certain construction worker this July. If anything, Kanter figured to be someone who could prop up the offense at times for a team that we knew would have trouble scoring1the Knicks are currently 25th in offensive rating, which honestly might be higher than I expected. The dream scenario, of course, was that he would shore up his defense enough for him to become a marketable trade piece at the deadline. His counting stats say such a thing is possible. He’s averaging 15 and 12 and his PER is 20th in the league, ahead of guys like James Harden and Victor Oladipo. The advanced stats tell a different story. According to Cleaning the Glass, the Knicks are currently 7.8 point per 100 possessions stingier with Kanter off the floor then when he’s on, which is in the11th percentile league-wide. Put into context, New York is a slightly below average defense when the big man sits but becomes nearly four points per 100 possessions worse than the 30th-ranked Cavs when he plays. Making matters worse, he’s not even offsetting this deficiency in other areas. The Knicks are actually slightly worse on offense with Kanter on the floor, and they pull down boards at the roughly the same frequency when he plays as when he doesn’t. Fans who mostly pay attention to box score stats may find this a bit perplexing, so I’d strongly recommend checking out Drew Steele and John Schulman’s recent film breakdown, which explains far better than I can why Kanter’s advanced stats are what they are. At this point, it’s clearer than ever that Kanter not only won’t be back next year, but that his presence on the roster might actually be hurting not only the development of other players, but their chances to remain competitive in games as well2for proof of that, look no further than last weekend’s Raptors game, or the Pacers debacle earlier this season. About the only reason to want Kanter to remain on the roster through the end of the year is the prayer that some team will trade for him. Would a GM out there ignore the advanced metrics, thinking Kanter could provide 10 to 15 good minutes off the bench in the playoffs? It would have to be a team that would not only be able to send back the requisite amount of expiring salary3per NBA rules, a non-taxpaying team can acquire up to $5 million more than their outgoing salary (given the outgoing salary is between $6.5 – 19.6 million), as long as they don’t end up over the tax threshold following the trade. Put simply, it is possible the Knicks could exchange Enes Kanter’s $18.6 million salary for as little as $13.6 million in salary in return. A team over the $123MM tax line can only absorb 125% of the incoming salary, but be willing to do so as well. Of all the things New York might do between now and season’s end, taking back additional 2019-20 salary isn’t one of them. Even including them here is a stretch. They do have an equivalent salary to send back to New York in Wesley Matthews. Still, it’s almost inconceivable to imagine them thinking higher of Kanter as a player than Wes, who is launching over seven threes per game and hitting them at a nearly 38% rate. Dallas does have a top-five protected pick though, so maybe they look to acquire Kanter as a low key tanking measure. This works financially by swapping Kanter for Wilson Chandler and Amir Johnson4noting his one-year contract with Early Bird rights gives him a de facto no-trade clause, and he also cannot be traded until December 15. Currently, Johnson is technically the Sixers’ backup center behind Joel Embiid, although they also play small with Mike Muscala – a deep ball threat – in the middle sometimes. Johnson and Muscala currently own two of Philly’s four worst net ratings, but they’ve been down in that department as a team. While it’s conceivable they view Kanter as an upgrade over those two, the bigger issues here are that a) Chandler is almost certainly more valuable to them than the Knicks big man would be, and b) if they were to move Chandler, they’d likely do so for some additional needed shooting. This is the only one that has a semi-realistic chance of happening. Unsurprisingly, the VladFather would be involved. Because Sacramento is so far under the cap, there’s several ways this could work. They could simply ship back Kosta Koufos’ $8.7 million expiring salary (who New York would almost certainly waive) and be done with it. That, however, would eat up a lot of their remaining cap space. That might not seem like a big deal, but there are several teams over the tax line who may want to use Sacramento as a salary dumping ground before the trade deadline or even before the new league year starts in July. If Sacramento wanted to retain more of that space, they could also send back Ben McLemore (who the Knicks would also waive) and the salaries would get much closer5McLemore makes $5.4 million and is also expiring. Would Sac-Town do it? There are a few things to consider. For one, the move would essentially end Marvin Bagley’s minutes at center, where he’s playing nearly half the time according to Basketball Reference. That might be a good thing; according to Cleaning the Glass, the Kings are not good with Bags in the middle, although it’s early to make that kind of judgment6CTG also only has him having played 43 possessions in the middle, so that number might be off. Assuming the Kings think Kanter can help them make a playoff push, the bigger issue would be what the Knicks would demand in return. Sacramento doesn’t own either of its own picks in 2019, but does have two second rounders incoming in each of the next three years, starting this June with the pick they received from the Knicks as compensation for Scott Perry. They could look to deal that pick back to the Knicks, which exercises as the second least favorable among Cleveland, Orlando, and Houston, or look to deal a second round pick beyond 2019. They also have an interesting young big man in Skal Labissiere, although with New York’s roster construction, it’s tough to see them favoring him over a draft asset, especially since the Knicks owe their own second rounder to Brooklyn. So no, it’s not impossible to move Kanter’s mammoth expiring contract … just highly, highly unlikely. It certainly doesn’t hurt to try though. If they can’t, a buyout becomes an option, not only for the reasons described above, but because it could be seen as doing a solid for a veteran who deserves the chance to latch on with a playoff team. Whether another organization takes that bait is anyone’s guess.